Channel a touch of effortless ladylike elegance on special occasions. Fashioned from a stretch jersey fabric for the bodice, cut into a flattering v neckline and cold shoulder and finessed with a romantic floral print on smooth chiffon fabric to add a dose of femininity. Complete with a belt to cinch you in at the waist. Love this dress, it fits perfectly, very flattering. It's light and floaty, the length is perfect for me, I'm 5ft6. Would order in every colour if I had an occasion to wear them to! I am so impressed with romanoriginals! From start to finish. The dress arrived very promptly & it was so well packed it took awhile to get to the dress, I was SO PLEASED with the quality and fabric, and it fitted perfectly, (I am size 14) I then ordered a hooded jacket, which also surpasses my expectations. I am now hooked, well done Roman!!!!!!! Absolutely gorgeous. The most perfect fit and superb quality. Excellent value for money and perfect fit. This dress was a perfect fit. It is well cut and flattering. The material hangs nicely. The pattern on the fabric is rich looking and perfect for any occasion. Love the fit n flare. It so suits my body shape- pear. I have four of them and love the midi and maxi lengths. I will continue to collect them as the colour and patterns suit me. This fitted dress feels lovely on. It hugs the right places and covers those bits that you’d rather not have. I’m only 5’ft 2” and love the way the skirt is cut shorter at the front and longer at the back, which I find quite flattering. 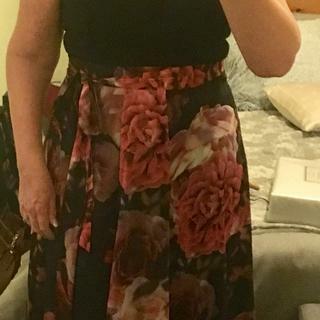 Very pleased with this dress which I bought for a wedding in May. I wear a size 12 normally and it fitted perfectly. Would definitely recommend and will buy again. Lovely fit and very flattering. Lovely fit and very flattering. Considering buying a different colour. I love the floral print maxi dress. I bought it for my nephew's wedding. I feel very feminine in it. Love it Roman thank you. Lovely dress, very true to size fit. Going to wear on a cruise we are going on. This dress is stunning. I bought it to go to a wedding in April and I can't wait to wear it! The fit is perfect to size and really comfortable, you will not be disappointed. Very good fit. Fabulous price, great value for money. I'm 5ft 2 would I be to short? BEST ANSWER:The model is 5"9 so it will come up slightly longer then shown, but it shouldn't be too long. I have been through some reviews and noticed that someone who is the same height as yourself has complimented the dress and its length. Hope this has helped.